Coral bells, Alumroot, Heuchera This group of hardy perennials has seen lots of attention from breeders in recent years. 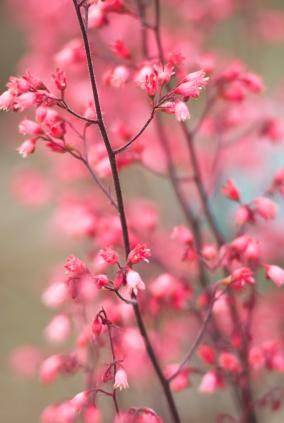 Once regarded as rather old fashioned, the traditional garden coral bells has panicles of diminutive pink to red-orange flowers that form a haze of color about the lobed leaves. Now a host of cultivars are available in a huge variety of leaf colors and forms. There are around 36 species of Heuchera native to North America, some more showy than others. Hybrids of Heuchera americana and H. sanguinea are the most commonly grown. One very popular cultivar is H. 'Palace Purple' which has deep purple leaves and reddish-purple stalks with white flowers in late spring. When grown in sun, the leaves turn a bronze color. Other cultivars feature leaves that are chartreuse, ruffed, silver veined or chocolate colored. Some have been selected for larger flowers as well. Both the leaves and flowers work well in cut flower arrangements. Coral bells are hardy in zones 3-8. The cultivated varieties do best in evenly moist, well-drained soil with lots of organic matter. They are intolerant of heavy clay soils and prefer a neutral to alkaline pH. In hot climates coral bells do better in partial shade. Division every three years will help insure the longevity of your plants. Some native species, such as Prairie alumroot, Heuchera richardsonii, thrive in full sun and tolerate drought conditions. Its flowers are green and rather inconspicuous, but the leaves turn bright red in autumn. Scientific name - Heuchera spp. Plant coral bells 12 to 18 inches apart in spring or fall. Most types have a mounded form 12 inches tall with the airy flower stalks reaching another 12 to 24 inches. Remove spent flower stalks after flowering for a second flush of blooms. Heuchera are easily grown from seed. Sow in trays indoors in late winter, or directly in the garden once the soil has warmed. Plants may be increased by division in autumn, or rhizome cuttings rooted in heat during spring. As plants age the crowns grow up out of the soil and should be mulched or lifted, separated and replanted. Coral bells are generally free from pests and diseases. Mildew can be prevented by spacing plants properly to ensure good air circulation. Mulch in winter in cold climates. Tidy up in spring by removing dead leaves. In the landscape Heuchera are lovely at the edge of the woodland garden, as an edging plant in front of shrubs or taller perennials, or as an accent in perennial borders. Pair them with ornamental grasses, irises or hostas for a contrast of form and texture. The dried, powdered root has been used medicinally as an astringent to treat ulcers and dysentery. The common name alumroot comes from its use as a mordant in dying textiles, where it is a substitute for alum. Coral bells attract hummingbirds.